This is not to say we have to form a new party. These ideas could be adopted by Democrats or Republicans. Democrats could borrow ideas from this site to siphon away libertarian-leaning swing voters while still putting forth a progressive, environmental agenda. Republicans could use these ideas to siphon away progressive leaning freedom lovers from the Democrats. I invite maverick politicians from both parties to steal away as they see fit! But I despair of convincing either party as a whole to adopt new ideas wholesale. The Democrats are smug in their recent victories. The Republicans have retreated into their talk-radio echo chambers. Core activists of both parties spout talking points in order to sound united (and avoid dangerously independent thought). Note the political map below. See the gaping market niche in the upper left quadrant. A new political party could fill it. 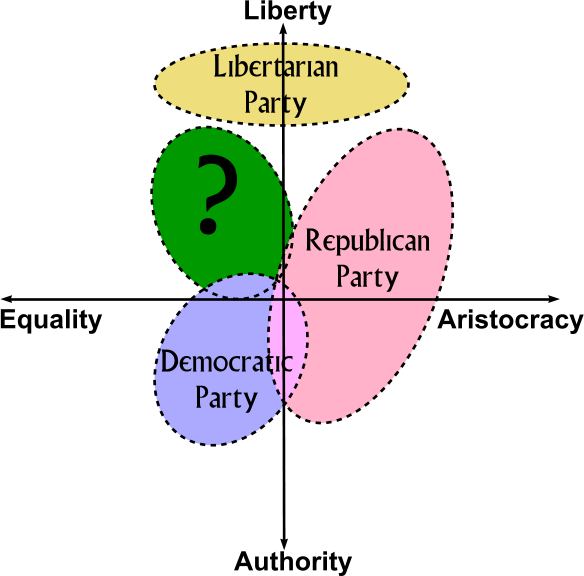 Back in 2005-2006 I tried to get the Libertarian Party on the road to filling that niche. Were they to cut back on the one-dimensional thinking and realize that protecting nature, taking care of the needy and providing opportunities for the poor are positive values in and of themselves, Libertarians could occupy this niche and win elections – and in the process further their own value of smaller government. To this end I founded the Libertarian Reform Caucus and gathered moderate libertarians in an attempt to get rid of the LP membership oath and moderate the platform. After the 2006 LP Convention, “The Portland Plank Massacre” according to the LP’s radicals, I felt compelled to write down my vision for a third party. In the fall of 2006 I got the time to write, and penned a “Business Plan for a New Political Party.” I posted it on my old Quiz2D site for some time, but this year (2008) decided it really belonged here. So I created a new topic area and hereby post the plan as the chapters therein. In the process I have reordered things somewhat and made updates. Let me be clear from the outset: third party politics in the United States is very, very hard! The system is rigged to favor two parties. That said, I have discovered two loopholes in Duverger’s Law. Successful third party politics is possible with the correct strategy. Moreover, I have learned many hard lessons during my years with the Libertarians. In the process I have identified many ways to better efficiency and lower overhead. A party a tenth the size of the LP could be more effective than the LP using the ideas in this plan – and thereby grow into something significant. But a tenth the size of the LP is still well beyond my current resources. If you find the ideas on this site interesting, and the plan that follows worth pursuing, feel free to drop me a line. Just don’t expect action real soon. I need to gather a lot of names of people to making a real commitment before going forward. At the very least, we need to be able to hire the legal and accounting expertise to get though the hoops of modern campaign finance law. Either that, or find expert volunteers willing to donate a great deal of time. So, if you drop me a line, I’d appreciate your giving me a rough estimate of how much time and money you’d be willing to commit to the project should it get off the ground. Now, without further ado, my manual on how to start a new political party in the United States .